Guido Bardelli was born in Barre, Vermont in 1907. When his father died in Vermont, his mother moved the Bardelli family to northern Idaho, ultimately settling in the mountainous mining town of Burke. Guido bypassed a fling at amateur fighting and engaged in his first professional fight in Mullan, Idaho as a 17 year old against Ben Grenich, a seasoned ring campaigner. The fight lasted one punch from the right hand of teenage Guido. Grenich was knocked out and he was only able to leave the ring with the assistance of his cornermen after regaining his senses. Nicknamed "Young Firpo" by an old time fighter and trainer, who had seen similarities in Guido to Luis Firpo of Argentina, Guido Bardelli soon became recognized as a knockout sensation unlike any fighter witnessed throughout the history of Pacific Northwest boxing. A dozen or so fights and he had the Coeur d'Alene Mining District and the Pacific Northwest in his grasp for the combination of his physique, quicksilver feet, hand speed and dynamite punching power, captured the imagination of fight fans who realized that within their midst was the makings of a world champion. He was called "Young Firpo" by the media and "Guido" or "Firp" by those closest to him. The media also tagged him with the sobriquet of "the Wild Bull of Burke." Young Firpo's fighting style and vicious punching was described by sport's writers of the time, including the likes of L.H. Gregory, Don McCloud, Dan Walton, BillyStepp, and Reddy Gallagher, in terms that dramatically recognized that Young Firpo was unique in the annals of boxing history. For example, in a 1937 Portland Oregonian editorial, Gregory wrote "There's only one Young Firpo on earth. No other battler, anywhere, fights as he does. His is one of those peculiar styles a man has to be born with." L.H. Gregory, the dean of Pacific Northwest boxing writers, in a 1971 Portland Oregonian editorial, recalled the exploits of Young Firpo when he described Firpo and wrote that he had "never seen more active fighting in the ring," in more than fifty years as a sports writer, than the "sensational," overwhelming force of Young Firpo. "Young Firpo was unforgettable,” he wrote. His fight career commenced in 1924 and he retired from the ring in 1937. There were many great light heavyweights during that era and Young Firpo's record reveals that he took on all who were willing to enter the ring with him. As one's mind drifts to a bygone era, the names and visages of some of the opponents he faced ... Harry Dillon, Jimmy Darcy, Del Fontaine, Pete Cerkan, Frankie Wine, Dusty Miller, George Dixon, Tiger Thomas, Fred Lenhart, Leo Lomski, Wesley KO Ketchell, George Manley, KO White, Tiger Jack Fox, and John Henry Lewis ... eventually emerge from the shadows of the past and into the ring spotlight, again awaiting the clang of the bell to face the lethal and sensational punching capabilities of Young Firpo. After capturing the Pacific Coast Light Heavyweight Title by dethroning Ketchell, and engaging in multiple defenses, the consensus was that it might be easier to win the Light Heavyweight Championship of the World than it was to dethrone the Pacific Coast Light Heavyweight Champion, at least while the title was being held by Young Firpo. Included among those who sought to dethrone Young Firpo, but who failed in the process, were George Manley, the railroader from Denver who perennially contended for the light heavyweight throne; Wesley KO Ketchell, the sensational southpaw knockout slugger who ruined many an aspirant's career; Tiger Jack Fox, a product of Indianapolis and one of boxing's all-time leading knockout artists; and John Henry Lewis, generally recognized as one of the top ten light heavyweights of all time. "Young Firpo, light heavyweight champion of the Pacific Coast, rated in the February issue of the boxing magazine as being the seventh greatest 170 pounder in the world, arrived in Butte from his home in Idaho yesterday to visit with his trainer, Mel Epstein. Firpo is signed to fight MaxieRosenbloom for the title this summer at Multnomah Stadium in Portland, Ore. The bout is scheduled to go 15 rounds and will be the first title bout ever held in the coast city. Many sports writers of the Pacific Coast who have seen the Idaho miner in action give him an even chance to takeRosenbloom's crown. A terrific puncher with an unorthodox style of milling, Firpo has become the most sought-after fighter in the West. The Wild Bull of Idaho holds two wins over Leo Lomski, stopped Wesley Ketchell, Roy Williams, and George Manley while he also defeated Tom Patrick, and George Dixon, besides a score of other first class fighters. Tragically, a disagreement over Firpo's percentage of the gate receipts lead to the cancellation of what would have been a classic match between the "terrific puncher" and a stylist --- the relentless slugging and blinding speed of Young Firpo against the defensive wizardry of title holder "Slapsy" MaxieRosenbloom. Later in the year, in the spring of 1934, while enroute to Butte, Montana, to fight Gorilla Jones, Young Firpo was involved in a life threatening car wreck where he suffered serious injuries. At the time, the injuries, which hampered him for the balance of his career, were thought to signify the end of his ring career. He was hospitalized and following his release from the hospital, he sought to recuperate within the beloved and rugged mountains enveloping his home in Burke, Idaho. As he started to get his strength back by the late summer of 1934, the Portland Boxing establishment sought again to match Rosenbloom and Young Firpo. The fight was to be a non-title affair although, Firpo's Pacific Coast title was to be on the line. Again, inexplicably, the fight fell through. Instead, the Portland establishment offered Firpo a "tune-up" fight with none other than Tiger Jack Fox, who had made a name for himself in the boxing world. Firpo ducked none and accepted the challenge and put his coast Light Heavyweight championship on the line against Fox who entered the fight as a heavy favorite due to Firpo's injuries and inactivity as well as the sensational punching display made on the coast by the Tiger, John Linwood Fox. Firpo, however, rose to the challenge and in an epic August 28,1934, slugfest, which saw both fighters on the canvas in the 5th round, Firpo successfully defended his title against Fox who also has gone on to be generally recognized as one of the all time great Light Heavyweights in the history of boxing. The Portland Oregonian described the fifth round in the following manner: "Firpo was the first to be knocked down. Firp has just crashed an awful left to Fox's face. The colored man suddenly retaliated with a savage rush in which his long arms swung like pistons, throwing fearful punches to Firpo's face and stomach. A right to the chin sent Firpo to his haunches near the ropes. Almost instantly, and before the referee could count, Firpo had bobbed up again - - - and the Bull came up fighting. As he rose his arms were flailing. A left and right smashed Tiger Jack on the chin, and in turn he sank to the floor. Fox also was up almost instantly but not until Referee Louttit had tolled a count of one over him. Fox at once rushed Firpo to the ropes. In a wild clinch there he bent the Burke miner's body backwards until it looked as though he would break him in two. Referee Louttit dashed in and pried them apart, then gave Fox a vigorous warning for rough battling. The sensational round was not yet over. Firpo charged Fox and belted him an awful left to the chin. He bobbed to the floor in his famous crouch, shut up again swinging, and a right half knocked and half pushed Fox through the ropes and to his haunches. Referee Louttit evidently considered it a shove rather than a punch for he helped Fox to his feet and did not count. Just at the bell, Firpo uncorked a fierce right to Fox's belly.... On the score by rounds, Firpo took five, Fox three and two were even including the tenth." The Portland, Oregon, boxing establishment was excited in believing, seemingly, that Firpo had lost little of the greatness that he exhibited prior to his being injured in the car accident while traveling to Butte. Another challenger to Firpo's Pacific Coast title emerged out of Phoenix, Arizona by way of San Francisco. This was the sensational teenage conqueror of the then Light Heavyweight Champion of the World, MaxieRosenbloom, none other than John Henry Lewis. Lewis on his march to the World Light Heavyweight title and ultimate recognition as one of the greatest light heavyweights of all time, challenged Firpo and the Wild Bull heartily accepted Lewis's challenge for a shot at Firpo's Pacific Coast title. On September 20, 1934, a youthful and vibrant John Henry Lewis stepped into the ring to swap leather with the great Italian slugger. The Portland Multonomah Stadium crowd witnessed a sensational fight that saw Lewis monopolize the early rounds only to witness Firpo turn the slugging match completely around with a barrage of sensational slugging which had Lewis virtually out on his feet in both the sixth and seventh rounds. A portion of the sixth round was captured by Billy Stepp who wrote: "Firpo's lefts and rights connected. One right almost tore Lewis' head off, and if ever a fighter folded, John Henry did, and like an old-fashioned canvas bag." The fight was called a draw by referee Tom Louttit. Steppe wrote: "The bell ended the 30-minute party and, of course, Referee Louttit's decision caused a near riot. It was O.K., but if a winner was to be picked yours truly has to give the silverware to the Bull of Burke * * *." The fans booed the decision for over 10 minutes. Lewis was fortunate to leave Portland for San Francisco still a viable contender for the world light heavyweight championship rather than having been carted or assisted to his dressing room as so many other of Firpo's opponents had including the likes of Ben Grenich, Mike Brotherton, Buck Ladeaux, KO White, Ray Pelky, Wesley Ketchell, George Manley, Leroy Brown, Nash Garrison, and a host of others. Firpo challenged and sought for years to engage world light heavyweight champion MaxieRosenbloom into a title fight but his efforts were in vain. Similarly, after Bob Olin won the championship Firpo challenged Olin to defend his title but this challenge, too, fell on deaf ears. After Olin had taken the title from Rosenbloom, Firpo wired a Spokane promoter: "Will fight Fox, Lewis, Rosenbloom or Olin. I fear no man." Ironically, after John Henry Lewis defeated Bob Olin in 1935 to take the light heavyweight crown, Firpo challenged Lewis who refused to risk losing his title to Young Firpo, perhaps having in mind their prior encounter when Lewis was given a shot at Firpo's own Pacific Coast light heavyweight title on September 20, 1934. The words written by Billy Steppe, following their Portland slugfest, had become prophetic: "Try and get 'em down for a rematch ... yes, just try and get Lewis to go into that ring again. Firpo would but try the other chap." Lewis' management wanted no part of risking the title and lucrative paydays in defending it against lesser lights. Young Firpo, on the downside of his career at the time, was still recognized as too dangerous to the Lewis entourage. Throughout his entire ring career, with the exception of a brief interlude as a teenager while his career was starting and he was in the managerial hands of Chuck Snyder, Young Firpo never had a fight manager. He trusted no one who called himself a manager. Irrespective, Mel Epstein became his trainer for a great many of his fights during the 1930s and it was Epstein who was in the ring with Young Firpo during many stirring epic battles including those he had with Leo Lomski, Tiger Jack Fox, Wesley KO Ketchell, and John Henry Lewis. In a late November, 1971, gathering of boxing notables in Los Angeles, a Mel Epstein trained and managed fighter, Rick Farris, was invited by Suey Welch to attend a luncheon where approximately 18 boxing notables had gathered. Welch knew that Farris had a natural affinity for the history of boxing. 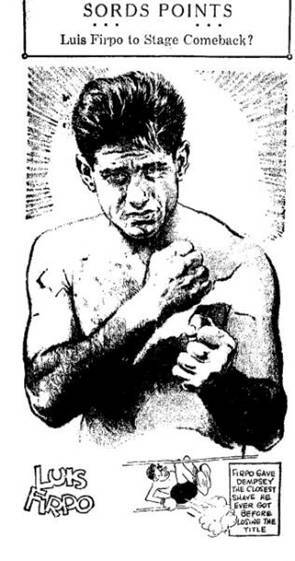 Mel Epstein had touted the seemingly unbelievable exploits and punching power of Young Firpo to an impressionable Rick Farris in striving to point out to Farris what Epstein had seen and been exposed to during his association with Young Firpo in terms of Firpo's strength, punching power, and endurance to the point that Farris began to challenge Epstein's credibility. Undoubtedly, Epstein, as a fight manager, was motivating and Farris was not buying into all of what was being offered to him. Included at the Los Angeles luncheon were Jimmy McLarnin, Gorilla Jones, George Parnassus, Suey Welch, Mel Epstein, Henry Armstrong, Ike Williams, Enrique Bolanos, Lou Nova, Mike Mazurki and others. Fighter-historian Rick Farris was absorbed and awe stricken as he listened to boxing story after boxing story emanate from the mouths and hearts of those in whose company he had been invited. Farris' ears were heightened when he heard the name "Young Firpo" mentioned by George Parnassus in a conversation with McLarnin and others. At this point, seeking more than anything a desire to test the credibility of his own fight manager, Mel Epstein, Farris entered into the discussion by asking George Parnassus, "How good was this Young Firpo?" Before Parnassus could answer the question, Jimmy McLarnin responded to Farris' inquiry by stating,"Oh, let me just tell you that Young Firpo was the greatest fighter I ever saw!" Then, without a break in the conversation, both McLarnin and Parnassus offered their opinions that "Young Firpo was the hardest hitting light heavyweight I have ever seen." To drive the point home further, Parnassus stated to Rick Farris, "You think that Bob Foster can hit hard? Young Firpo could hit harder than any of them, including Archie Moore and Bob Foster," a point which was affirmed by Jimmy McLarnin whose career, incidentally, paralleled that of Young Firpo during the 1920s and 1930s. McLarnin, hailing from Vancouver, British Columbia, had seen Firpo fight on the Pacific Coast many times during Firpo's reign of terror. Up until the date of his death, Mel Epstein lamented to all who would listen, the fact that, in Young Firpo, he had a world's champion in his grasp and, like water slipping through one's fingers, that championship eluded him as it had eluded Young Firpo. Epstein stated in a 1970s interview that "Before that damn car wreck, Firpo was unbeatable, he was practically unbeatable!" Although Young Firpo never won the light heavyweight championship of the world, perhaps Billy Stepp summed up his fight career in a single sentence. Stepp wrote near the sunset of Firpo's career: "A world's champion was Young Firpo if ever there was one." But then, again, as his family and friends so well know, there was much more to Young Firpo than the world of boxing and any championship. In the spring of 1950, it was reported in the Spokesman-Review that Firpo had begun promoting boxing shows in Wallace, Idaho. Firpo had headlined in the Northern Idaho mining town many times during his boxing career. The above was written by John A. Bardelli.